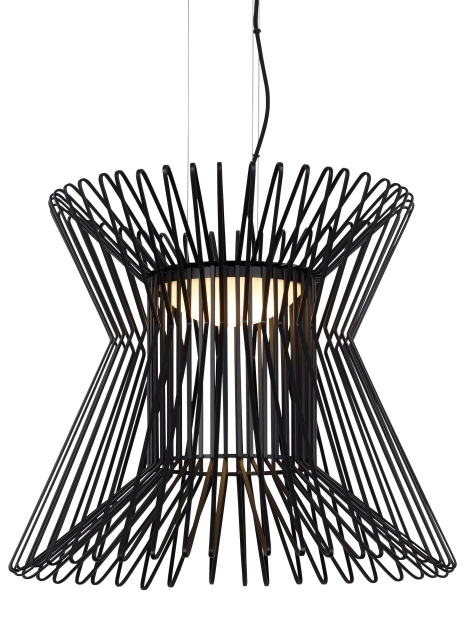 The modern Syrma LED pendant light from Tech Lighting features dozens of machined metal rods which are painstakingly fastened at perfectly spaced intervals to form an incredible multidimensional shade. This pendant is available in a scalable 19 inch height and a modest 21 inch width allowing light to illuminate smoothly through the diffused LED light source. The Syrma is ideal for kitchen island lighting, dining room lighting, home office lighting, entry lighting or even commercial conference room lighting. Inspired by mid-century modern design, the Syrma is offered in your choice of Matte Black or Satin Gold finishes and includes a coordinating cloth-covered cord and ceiling canopy. Includes 17 watt, 881 delivered lumen, 3000K LED module. Dimmable with low-voltage electronic or 0-10v 120-277V universal dimmer. Matte Black finish provided with twelve feet of field-cuttable black cloth cord. Satin Gold finish ships with tweeve feet of field-cuttable cord. Available in two sizes – a sizable 19” height and an oversized 38” height for dramatic impact.